Fairy petticoats and wings for sale! I’ve been cleaning up my studio, going through boxes and bags left over from my kit making days. Even after I discontinued the kits, I would buy flowers out of habit, so I have a lot in my stash. Now, I’d like to clear space for the post-fairy phase of my artistic career. I know that some people who make fairy dolls from my how-to book, Felt Wee Folk have trouble finding the right kind of petals for skirts and wings. So, I’ve decide to offer them for sale in my Etsy Shop. 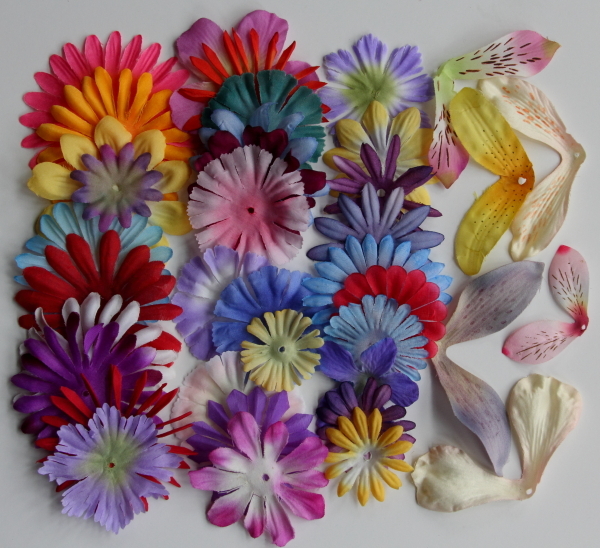 I’ve put a variety of colors and sizes in packages with enough petals to make skirts and wings for 6 fairies. Also, for each purchase of Felt Wee Folk, I’m including a bonus bag with enough petals to dress 2 fairies. You still have to find acorn caps and the other parts yourself, but there are enough petals to get started. That is, until you get hooked on making them and have to go in search of more supplies! This entry was posted in Etsy Shop, Fairies by Salley Mavor. Bookmark the permalink. I’m so excited. I just order the book and some wings and petticoats. Hope to have some made by Fairy Day (June24) – thanks so much.